This is just too good an analysis not to share with everyone. It comes to us from the "Political Math" blog (I linked to his analysis of Rick Perry job numbers--last entry in the "must read" column on the left). 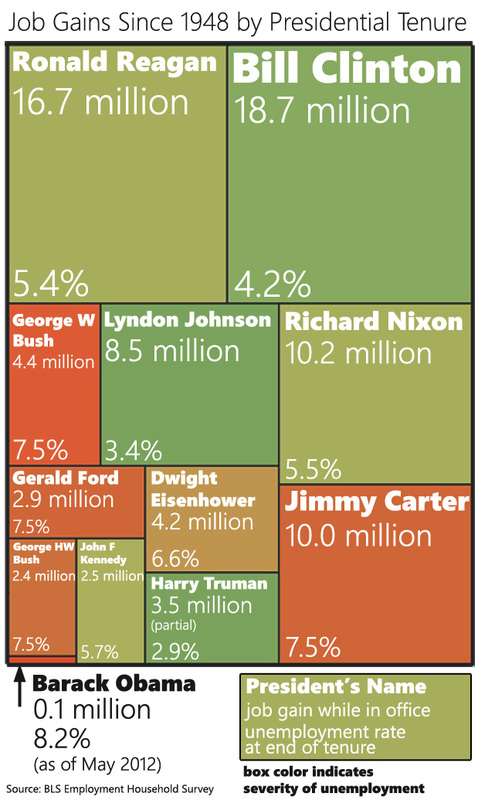 From it, we can get a graphic understanding of the jobs each President created since Truman. It's dated June of this year (which means I need to visit that website more often). Recently President Obama’s team has felt that attacking Romney’s jobs record in Massachusetts tests well in the sample group. You can also download a larger version of the chart. I find it difficult to create visualizations that work well in both blog form and Facebook-sharing form. This was my attempt at a compromise. Is this a fair comparison? Yes and no. Part of the Goose/Gander series is that I create a provocative visual and then explain in more details what is fair and isn’t fair about it. Now, as with all analyses, there are a number of caveats to go with it and he cites the problems on his page. The Big Lie Democrats are telling (funny how fascists always use the same tactics) American citizens is their claimed number of new jobs created. 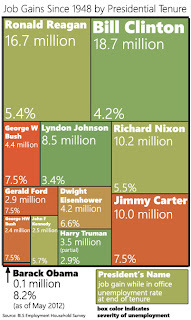 I've heard repeated claims--the latest from Stephanie Cutter yesterday--that "Obama has created 4.3 million jobs." Democrats believe if you repeat a lie loud enough and often enough people believe it's the truth. The questionable technique Democrats are using is to begin counting "new jobs" created from the lowest employment levels achieved in 2009 (when unemployment reached over 10%) and move forward from there. The problem is, that fails to account for the millions of jobs shed--also under Obama and the Democrats gentle tutelage. The truth: The economy began going south under GWB, not due to any of his policies nor to those of Republicans in Congress--though it is more than fair to attack them mercilessly for the reckless amount of spending they indulged in prior to 2007 when Democrats took over the reins of both houses of Congress. 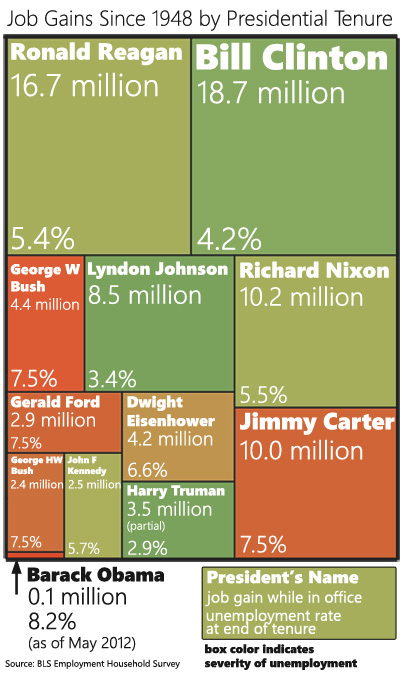 What Republicans did to excess, Democrats then put into overdrive. After their initial budgets in FY 2008 and FY 2009 Democrats figured out that--under the current policy of "base-line budgeting"--if they NEVER PASSED A BUDGET, all of that spending was AUTOMATICALLY INCLUDED in the next year's budgeting. The result, four consecutive years of TRILLION DOLLAR DEFICITS. Add to all of that spending, an insane policy which forced banks to lend money to millions of prospective home-buyers WHO COULDN'T AFFORD THE PAYMENTS and were never suited for home ownership. When Democrats were confronted with the inevitable difficulties such an insane policy would cause, they simply denied all problems and refused to act. When all of those house loans built of dead paper collapsed it took the economy with it. As Blogger Political Math says, no president has any real control over the economy, what he provides is LEADERSHIP and President Obama has provided NONE throughout his entire term in office. Anyway, enjoy the data and the arguments it leads to.